Behind the ancient doorways of Lectoure lie unimagined worlds, and this property is perhaps the most surprising of all. An ancient doorway, set in a medieval street is both architecturally exceptional as to be of note, and yet discreet enough that that we discover it as if for the first time, on the day of our visit. 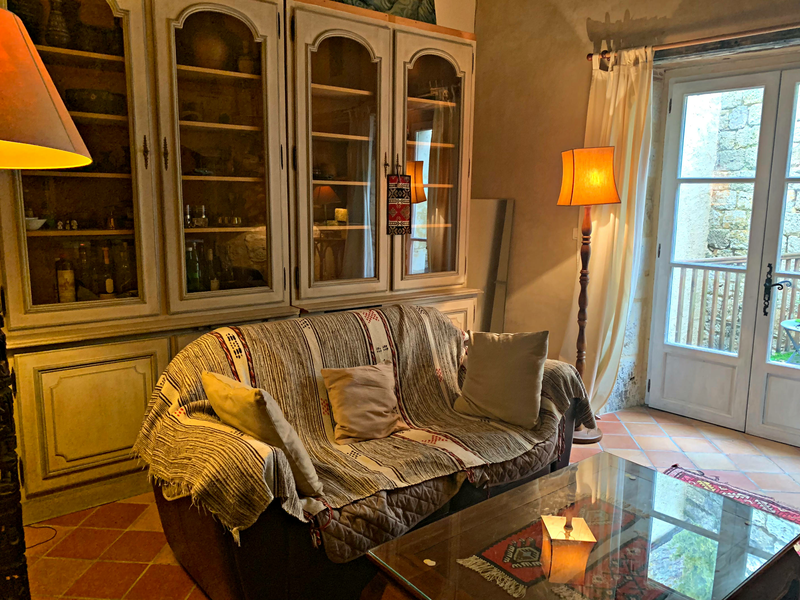 Located in a medieval ruelle of Lectoure, and bathed in sunlight from the southern ramparts, there is a sense of mystery, and a faded air of Italian Renaissance in the ochre coloured walls and the arch of the stone doorway. Reminiscent of a doorway in an old film, it is easy to imagine standing in this ancient alley way in a long, hooded cape, and knocking three times, before being admitted into the stone passageway, and up the original stone staircase to the high-ceilinged rooms above. There is a whisper of the theatrical throughout, and the imagination is fired from the outset. Watchtowers such as this one, were built relatively quickly, compared to the decades of construction required for the local châteaux, and usually comprised of three floors. The house was added sometime in the late 17th early 18th Century, and also built in stone, softening the edges of what would otherwise have been a symmetrical tower. A vast garage and cellar stretches across the full expanse of the ground floor. This is currently used as a workshop with ample place for the owner’s collection of motorbikes and cycles. The square blocks of hewn stone and the giant oak beams which stretch across the ceiling and support the upper floors are a testimony to the skills of the medieval builders working at a time when properties were constructed to span the centuries. The impressive vaulted ground-floor has been meticulously restored so that it is impossible to distinguish between the original oak beams and the occasional areas which have been repaired. As with the rest of the property the renovations are discreet enough to pass un-noticed. The electrical cupboard, and laundry area on the ground floor, are carefully dissimulated behind bespoke wooden doors. On the surface nothing has changed since the sixteenth century. Once the doors and windows are opened, and the old shutters pinned back for the first time in years, this entire space is bathed in light, creating the potential for a fabulous workshop, atelier, or ground-floor appartment. The owner demonstrates how easily the ambiance can change by opening the shutters on the doors and windows to each side, revealing the potential for an incredible commercial space (relevant permission pertaining) looking outwards to the town and vanquishing the property’s cloistered air in an instant! A set of original stone steps lead from the hallway to the first floor, and as we pass, we observe the curvature of an ancient stair rail set into the stone wall, a trace of a much earlier staircase, its wood smoothed by the touch of hands from long ago. At the top of the stairs there is a warm and vibrant hallway, which draws the eye in as if to a private appartment, a stark contrast to the stark stone and oak of the atelier below. The colours here are warm hues of red, grey and gentle shades of white; a warm pulsating heart to the property; a cocoon of comfort after the masculinity of the architecture on the ground-floor. If the ambiance downstairs is decidedly medieval, there is something of the romantic Gothic on the first floor, married with later 18th century additions; a blend of styles that bring the room to life anew; thanks to the eminent good taste, humour, and choice of furnishings and décor, chosen by the present owner. Shadow and light are at play throughout. A south facing study, dressed as a cosy working area with a desk, overlooks the southern ramparts. Used as a music room, a vinyl record plays on a vintage turntable, lending this room the air of a small refined Parisian appartment, opening onto a spacious bedroom, also facing south. (The study is spacious enough to create a third bedroom if desired, with space on the external landing for a separate entrance). On the landing opposite there is a recently refurbished bathroom, and a small landing leading to a much larger, more formal, reception/dining-room, with high ceilings and an ornate fireplace – where the 18th century influence is much in evidence. From the dining-room, there is a first-floor kitchen, whose colour scheme has been designed to match the original vibrant turn-of-the-last-century red and white chequered cement floor tiles. A cherry-red fridge offers a vibrant note of humour, tempered by the buttery coloured stone sink which has been designed for the space. A traditional black range is set into the modern style lower work cupboards, with a selection of restored antique wooden cupboards creating a practical yet aesthetic working area, next to the dining-room. This part of the building, comprising: a bedroom, bathroom, study, dining-room and kitchen, with a private landing and doorway, can be entirely closed off from the rest of the house, enabling the owner to use the property as one single space, or to divide the house, on two sides. The ambiance on this side of the building in very much that of a private appartment, with separate living accommodation for the owner, should the rest of the house be used by family, guests, or possibly tourists, for a luxury let. In the winter months, for a couple, or single person, this half of the property could be heated economically, or alternatively the whole house opened up for one single family. On the other side of the property there is an anti-chamber with a vast, bespoke ceiling-high cupboard in oak, originally designed by the current owner, to store vinyl records, with a ladder in situ for the top shelves. Beyond the anti-chamber, lies a second grand reception room, with the stone fireplace. Of note the decorative rose that lies in secret beneath the mantle, carved centuries ago. This is a wonderful evening room: a crimson sofa invites one to linger; a stuffed squirrel runs up a branch beside the original window, and a collection of marionettes adorn the sideboard, underscoring the eccentricity of this room. It quite simply feels as if we have walked in upon a film set. This is a playful room, where it is easy to imagine parties, or discussions late into the night, before a roaring fire. The room turns inwards into itself, to the life one creates inside, this is not a room with a view, but a room of shadows and ambiance, seductive and mysterious. A flight of wooden stairs leads to the upper floor and the bedroom with its spectacular views over the roof-tops of Lectoure to the south. Beyond, lies a second private bedroom/appartment suite. With an imposing original fireplace, this room is both an upper-level reception room and a bedroom. The en-suite shower room on this level offers an intimate view of the upper section of Lectoure Cathedral and its roof-tops. The property is sufficiently spacious as to provide distinct “sections” each separate from the other. With a potential of three bedroom in total, in a single spacious home, or two large private apartments, buyers will imagine a multitude of different possibilities. The property does not have a garden. “I came from Paris with the intention of buying a property in Lectoure with a garden. But when I visited the house and its ruined tower, I realised I was prepared to forsake visions of a garden, for the privilege of living here. There was no comparison. This is why I would say to anyone coming to visit the property, if being part of the town of Lectoure is your main consideration, come and see. The light that comes to play in each of the rooms, at different times of day, brings the outside in. I loved the sense of living in the heart of Lectoure but so privately. The heart of Lectoure and its parks and views are on my doorstep, and miles of countryside around. I sense that these walls will appeal to someone like myself, who finds a greater interest in living here, that I would have done, say, in a stone farmhouse, with a large plot of land. Perhaps this is the home for someone at a certain stage of their life looking in. Or with a business project in the centre of town that requires such a central location looking out. The future owner could so easily be a writer, a painter, an artisan. Sometimes it is helpful to say what something is not before we can determine what something is. This is not a property with a garden, nor is it a house with rooms on a single level. Let us not forget that in part this is a tower, built on three floors with the original stone staircase! There are currently no bedrooms or bathroom on the ground floor level – albeit, an entire appartment bathed in light could easily be created on the ground floor (relevant permissions pertaining). However, it is a tremendous piece of Lectoure’s history, in the heart of the ancient town, where all the town has to offer can is accessible within a minute on foot. It is a property which marries the brute beauty of the medieval with the finery of the eighteenth-century; and offers space, mystery and a sense of the theatrical. Shakespeare famously said that “the world is a stage” and this property is no less so. One cannot help but imagine the rich, intimate and imaginative lives that will play out here. Romanticism, vibrancy and eccentricity – secrets, mystery and ancient stone. Step inside – and create your own world within! Truly magical. And a little bit crazy too.